Phoenix, Arizona, March 23, 2019- In December 2017, Arizona State University’s (ASU) Vice President for University Athletics Ray Anderson shocked sports reporters, alumni, and others by selecting Herman Edwards, a former NFL player, and coach and ESPN commentator, as his new head football coach. After his first winning season and a trip to the Las Vegas Bowl, the pundits are convinced it was a good decision. 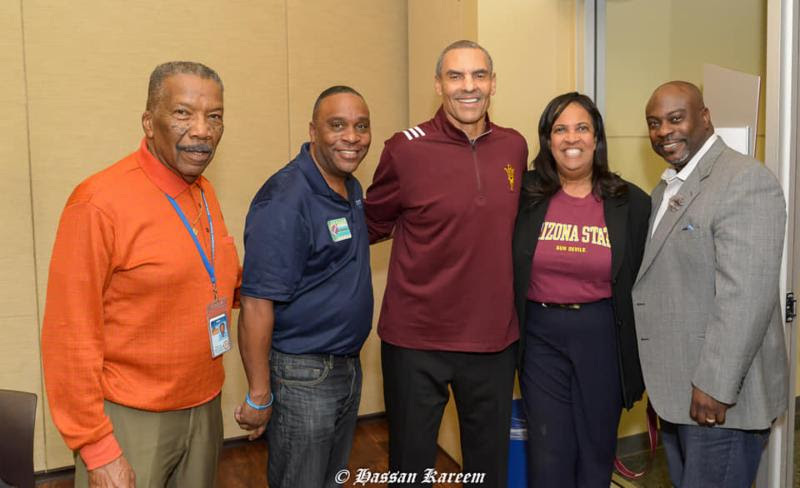 March 22, 2019 was Edwards’ opportunity to win over diverse community leaders and members at “A Conversation with Herm Edwards,” hosted by ASU and the Salvation Army Kroc Corps Community Center at 1375 E Broadway in Phoenix, Arizona. First, there was a short meet-&-greet, where the Coach, despite having knee surgery just eight weeks ago, shook hands and took photos with curious and enthusiastic Phoenicians from private business, academic, government and non-profit entities. People were excited and appreciated a chance to see him up-close-and-personal. A large spread of hot hors d’oeuvres were donated by Clarence Ferguson, a local chef, and caterer. Then the group was ushered into the Kroc’s Performing Arts Center, where they were welcomed by Hassan Kareem, who is CEO of Brotha Love Productions, and Jean Boyd, ASU Executive Senior Associate Athletic Director. Afterward, Edwards was interviewed by Denise Meridith, CEO of Denise Meridith Consultants Inc, a public and community relations firm, on the stage, after a short video showed him in action with the ASU Sun Devils. Edwards sincerely discussed the philosophy of life and career. Meridith asked several questions, which summarized some of the many queries that the audience had submitted in advance. Finally, Edwards fielded live questions from the attendees. Edwards was open and honest about his long-time relationship with Anderson, giving up “the make-up and cameras” to get back to the relationship with students, and what attracted him to ASU (e.g., emphasis on academic achievement of athletes; ASU is second only to Stanford in athlete graduation rates) despite other opportunities. It was easy to see why he is popular with parents and such an effective recruiter. He promises that his players will leave as better men than when they arrived. Of special note was his discussion of why he does not have the innumerable “rules” (e.g., color of socks) that usually plague student-athletes. He has three, undisputable principles, which can be summarized as 1) always be on time, 2) one’s actions must match one’s words and 3) everyone must compete. Violating any of those principles results in immediate consequences (e.g., not getting your uniform to play). Players have no doubt about what behavior and performance are expected. The attendees, the ASU Athletic staff and the representatives of the Kroc Center (which was an excellent event venue that many did not know about previously), all appeared thrilled with the evening and the Coach. Attendance at ASU football games has been an issue in the past. Phoenicians can support Edwards and his students by coming to the games this fall and winter. 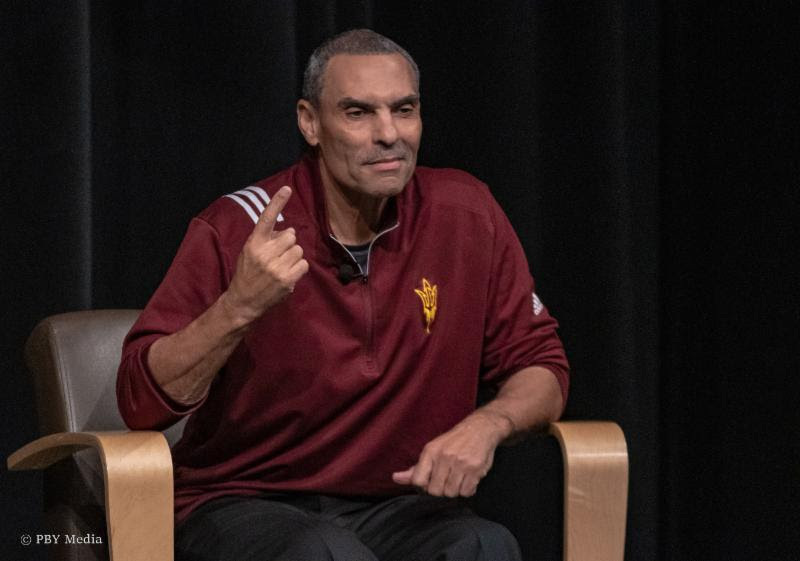 (Photo by Yulanda Gilliam) Arizona State University Head Football Coach Herman Edwards impressed the audience of community members that attended “A Conversation with Herm Edwards” on March 22, 2019 at the Salvation Army Kroc Corps Community Center in Phoenix. (Photo by Hassan Kareem/Brotha Love Productions) ASU Football Coach Herman Edwards (c.) met with community members, such as (l. to r.) Fred Taylor, Sean Swaringer, Denise Meridith who moderated the interview, and Dr. Vernet Joseph at “A Conversation with Herm Edwards” on March 22, 2019, at the Salvation Army Kroc Corps Community Center in Phoenix, Arizona. For 18 years, Denise Meridith has been CEO of Denise Meridith Consultants Inc (DMCI), a public and community affairs company, headquartered in Phoenix, Arizona. She is a public affairs executive, a professor at Arizona State University, author, and popular public speaker. She has published several books, including Thoughts While Chillin’ and its sequel The Year a Roof Rat Ate My Dishwasher: An Arizona Survival Guide for Entrepreneurs. Meridith is the National Reporter for the Florida Courier.